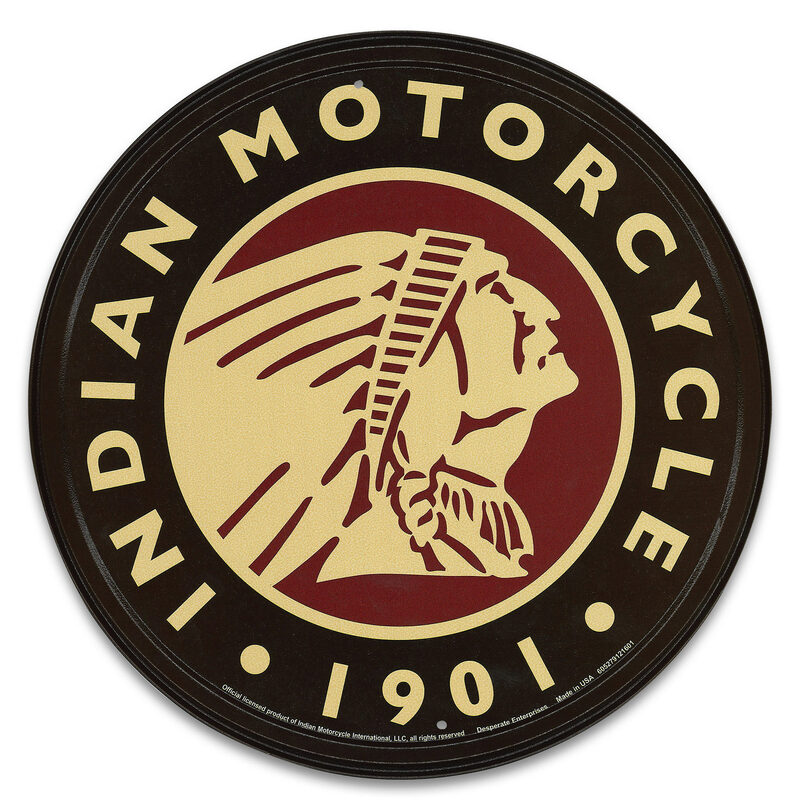 Vintage Style Tin Sign - 1901 Indian Motorcycle Logo - Antique Replica Placard - Man Cave, Garage, Biker Club, Shop, Home, Office Decor - Indoor / Outdoor - 11 3/4" Diameter | BUDK.com - Knives & Swords At The Lowest Prices! Liven your man cave, garage, cabin, vacation home, living room, bedroom, office - literally any space - with this sweet metal sign, an authentic reproduction of the classic turn-of-the-century Indian Motorcycles logo placard! Teeming with hip vintage style and cool, vibrant graphics, it's just what the doctor - or, interior designer - ordered to cure empty walls; dull, lifeless rooms; outdated decor themes plagued by kitsch; or any case of uninspired design in need of a shot in the arm! Most importantly, this eye-catching antique-chic sign imparts a sense of personality and individuality, especially in locales overrun with with artistic tastes that - much to your chagrin - are clearly not your own, i.e. a significant other’s, roommate’s, officemate‘s or that of anyone else with whom you share space. Easy to hang! And top quality, corrosion resistant metal construction and advanced, fade resistant printing even allows for posting outdoors! Get one for yourself and one to give away; makes a fantastic gift for bikers, vintage decor fans, antique enthusiasts - practically anyone!